Even before its dissolution in 1991, the Soviet Union was engaged in an ambivalent struggle to come to terms with its violent and repressive history. Following the death of Stalin in 1953, entrenched officials attempted to distance themselves from the late dictator without questioning the underlying legitimacy of the Soviet system. At the same time, the Gulag victims to society opened questions about the nature, reality, and mentality of the system that remain contentious to this day.The Gulag Survivor is the first book to examine at length and in-depth the post-camp experience of Stalin's victims and their fate in post-Soviet Russia. As such, it is an essential companion to the classic work of Alexander Solzhenitsyn. 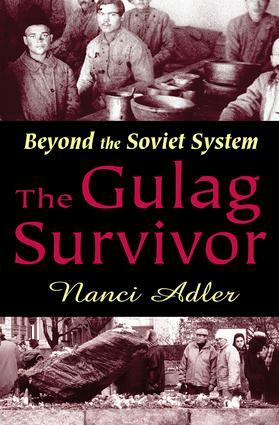 Based on extensive interviews, memoirs, official records, and recently opened archives, The Gulag Survivor describes what survivors experienced when they returned to society, how officials helped or hindered them, and how issues surrounding the existence of the returnees evolved from the fifties up to the present.Adler establishes the social and historical context of the first wave of returnees who were ""liberated"" into exile in Stalin's time. She reviews diverse aspects of return including camp culture, family reunion, and the psychological consequences of the Gulag. Adler then focuses on the enduring belief in the Communist Party among some survivors and the association between returnees and the growing dissident movement. She concludes by examining how issues surrounding the survivors reemerged in the eighties and nineties and the impact they had on the failing Soviet system. Written and researched while Russian archives were most available and while there were still survivors to tell their stories, The Gulag Survivor is a groundbreaking and essential work in modern Russian history. It will be read by historians, political scientists, Slavic scholars, and sociologists.